Delicious and nutritious, BIXBI RAWBBLE Freeze Dried combines the whole-animal nutrients of a raw food with the convenience of kibble. Rawbble is 98% meat, bones and organs to provide your pup with a healthy source of protein and to help give them healthy teeth and gums too. When foods are cooked, they lose a lot of their nutritional content. But Rawbble uses freeze-dried technology to lock more naturally sourced essential nutrients into every bite. A single-protein option for dogs with protein allergies or sensitivities. 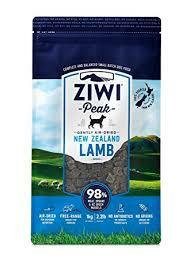 Ziwi is sourced only from local New Zealand farms, ensuring the animals are free-ranging, grass-fed and finished. For the perfect finishing touch, we add kelp as a natural vitamin and mineral source, and New Zealand green mussel for natural glucosamine and chondroitin.